I got a slow start today. There is so much I need to get done, so naturally, I ignored all of it all morning long. As the day dragged on, I started to feel guilty and anxious, but I didn't know where to start. I've been trying to create a daily walking habit, and I didn't go walking yesterday, so I was thinking another day off would kill the walking habit dead. However, my daughter is having a guest over for the weekend, and the room she shares with her little sister is a disaster in desperate need of work. The house is a small disaster too. It was clean three days ago, but six people living in a little house can create a lot of mess in three days. What to do? Since I was feeling overwhelmed and not sure where to start, I pulled out my cards and asked where I should focus my energy today; myself, my little girls' room, or the house and dinner. The first card, the Ace of Cups, is very clearly telling me that I need to fill my own cup or I will have nothing to give anyone else. It seems very obvious to me now, but putting myself and my walk on the back burner, in favor of cleaning my girls' room and the house would be a mistake. I'm coming out of a long lasting depressive state, and it is critical that I care for myself, and try to keep the momentum I've developed going. The cup holder in this card looks like she's out enjoying nature, so I'm taking some elements of the card literally today by making sure I get enough water to drink, and I went to the park and took a walk around the beautiful lake there. 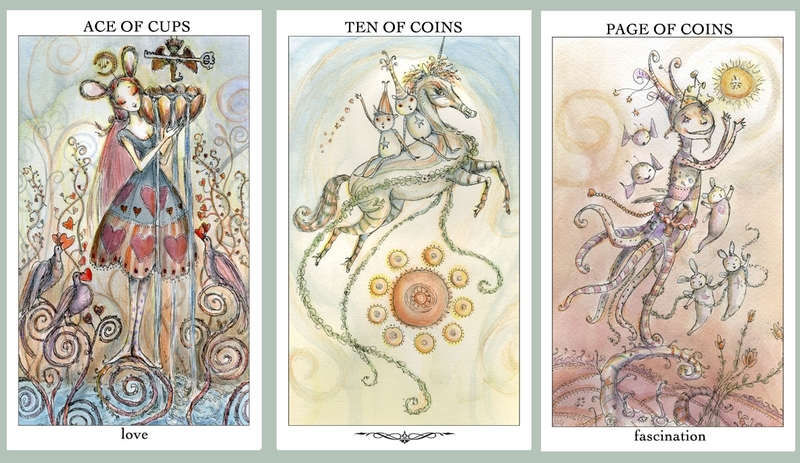 The Ten of Coins might not traditionally advise one to let their daughters clean their own room, but when I saw the two little sweeties riding the unicorn in the sky, I thought, of course this is what it is telling me. They're both motivated to do it because they prefer it clean and because a guest is coming to stay, which is always exciting. By cleaning their own room they will feel a great sense of accomplishment. They also get the chance to assess their own possessions, which is a very Ten of Coins kinda thing to do. As far as the rest of the house goes, I think this card is telling me to wait until my husband comes home from work, and then the whole family can tackle the house together. Again, this isn't a traditional meaning for this card, but there are six of us in our family, and the card has six little beings all coming together to celebrate or accomplish something. Many times in the past when I've been overwhelmed with the house, I declare it "time for a blitz!" I set the timer for 15 minutes, and we all work as quickly as we can to clean things up. I am always amazed at how much we can do in such a short time when we work together. So, I took that walk, decided to let my girls clean their room, with guidance from me, of course, and I will enlist the whole family's help with the house later on today. Oh, and I think I'll text my husband and ask him to pick up dinner. Hi Siddeleah. :) This is a lovely blog, and it's good for me to see Joie de Vivre Tarot, as it's not the type of deck I would normally use or give much attention to. I'm just wondering, is your hubby a Page of Coins type? Mine is a Page of Cups! Now, that's an interesting experience! Actually, I've been thinking of him as my Knight of Pentacles for the last few months, especially with all the extra hours he's been working to help us pay for some of the things I've been dreaming of doing and getting done. It really does seem to fit him. Page of Cups, huh? Is he a dreamer? Not a dreamer so much as very childlike. In the best sense of the word. He takes immense joy in cute things, and is always in a good mood unless he is physically ill. Just like a kid! That is an awesome way to be! This reading just put a huge smile on my face! I love when you take the cards in a whole new, personal yet meaningful direction :) And I think you're choices sound so self-nurturing, and also empowering of your daughters and family - just great! It worked out so well too! I didn't think my daughters could get that room clean without my help. It was really bad, but the did it brilliantly and were so pleased with themselves. Everything that needed doing got done, and I didn't have to feel resentful or guilty about skipping my walk.